The Pacific Justice Institute (PJI), a California-based right-wing advocacy organization, set a new standard for dishonesty on LGBT issues in 2013, concocting a story about bathroom harassment by a transgender student in an effort to deny transgender students access to facilities that match their gender identities. In a year that witnessed a spike in transphobic commentary by right-wing media, PJI’s lie proliferated on outlets like Fox News, highlighting the extent to which outright misinformation undergirds the conservative media’s anti-LGBT horror stories. For its willingness to lie in the service of undermining LGBT rights, PJI has earned the dubious distinction of LGBT Misinformer of the Year. Transgender student rights received newfound prominence this year, as Democratic California Gov. Jerry Brown signed a law in August guaranteeing that transgender students would be able to use facilities and participate in programs that match their gender identities. Meanwhile, the Colorado Civil Rights Division ruled this summer that transgender six-year-old Coy Mathis should be allowed to use the girls’ restroom at her school. PJI joined a coalition of right-wing extremist groups working to overturn the California law, but its effort to roll back transgender rights in Colorado propelled the organization to notoriety. As it pondered how to ensure that transgender students lost proper facility access, PJI ran into an inconvenient reality: School districts that allow students to use facilities that correspond to their gender identity have reported “nothing but positive results.” Right-wing fears about inappropriate bathroom behavior had no empirical basis. Fox Nation and other right-wing outlets ran with the story, touting it as proof that their fears weren’t so baseless after all. But when a reporter from The TransAdvocate questioned Superintendent Rhonda Vendetti about the story, Vendetti said that the report was based only on the complaints of an angry parent. “There has not been a situation” of harassment or other intimidating behavior, Vendetti said. Despite – or because of – PJI’s rabidly anti-LGBT stances, including support for “ex-gay” therapy, opposition to anti-bullying efforts, and its claim that teaching students LGBT history is “indoctrination,” PJI has maintained a warm relationship with Fox News. 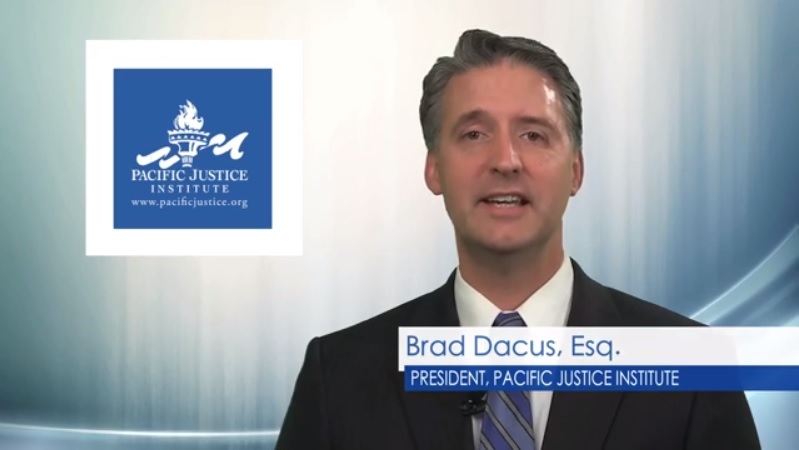 PJI President Brad Dacus appeared on the network as the debate over the California legislation started in addition to other appearances to attack LGBT history education, diversity education, and transgender-friendly workplaces. Fox’s coziness with PJI continued even after the exposure of the group’s Colorado lie. Fox host Sean Hannity began a December 18 segment on transgender bathroom access with a video from PJI featuring testimonials from parents at students at the Colorado high school where the fake story originated. Hannity called the video “pretty powerful,” but nobody in it ever pointed to an actual instance of misconduct by the transgender female who was allowed to use the girls’ restroom. PJI’s substance-free video and Hannity’s promotion of it even after the organization had been discredited marked a new low of shamelessness. With California’s transgender protections potentially headed for a state referendum in 2014, PJI will continue to play a role in fighting against LGBT equality, undeterred by the exposure of its dishonest tactics. Heading into the new year, media outlets covering LGBT issues confront a choice: they can either pretend that PJI is a serious organization worthy of respectful coverage, or they can ignore it as the willfully misinforming, viciously anti-LGBT organization it has proven to be. Why Is Fox's Hannity Promoting A Group That Got Caught Lying About Transgender Kids? PJI's Dacus: LGBT People Are Under "Satan's Dominion"